To begin from the beginning. It’s about her marriage, but Yashodhara Lal has touchingly dedicated her book Just Married, Please Excuse “To my family – for the material they provide”. Indeed, without the family JMPE would have little meaning. The dedication seems cleverly worded, for members of the bride and groom’s respective families too move with ease in and out of the pages and the marriage Yashodhara has so wonderfully penned a story about. This is, primarily, a hilarious account of the family life that she and Vijay embark on, right from the time they first set eyes on each other. It is about how “Y” – as he calls her – reacts when “Vijay usually said whatever popped into his head”. It is about her own shenanigans which she sketches with amazing ease of words. Both the situations she tends to land into so often, and the way she describes them, make you chuckle: You shake your head, you agree she is impossible and self-confessedly exasperating, and yet she is so likeable. You look forward to “Lambu” Vijay’s Hindi one-liners; you admire him for his fortitude and also his indisputable love for Y, complete with her quick temper and her gaffes and gawky ways. And you laugh and read on. About their life in Bangalore, the ducks he took her to admire and the plot of land they nearly bought; about Mumbai and life next to Bandstand, their maid and driver and their adventures. All keep you riveted. When Y is in the family way, things turn less funny. The pain of the Delhi-Mumbai distance between the couple when she goes to live with her Mom is palpable. Childbirth and the distance of a different kind between them now almost make you forget you were reading a funny novel. Yes, a child really does things to married life. Y hangs on bravely to her quirky views on life, and Vijay and his “Buntvinder” eventually are a loving couple again. But the book could have done with fewer pages on the harsh reality that hits the couple with the advent of one little bundle, Peanut. 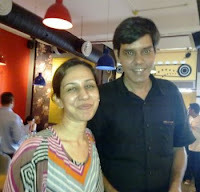 Yashodhara and Vijay at Mamagoto. I, for one, would still have liked to read before the book ended just a little more of the fun that undoubtedly came back to stay in their lives. All in all, though, the book is an eminently enjoyable journey that traces the making, and saving, of a marriage. Yash did affirm at our Mamagoto lunch that 99 per cent of JMPE was truthful reporting. Having read the book at long last, I’d say I believe her. Lovely review, Harjeet. Thank you! I must read this book. I'd love to know what makes or breaks a marriage. Ultimately, I think the key to happiness lies in not depending on any one but yourself to be happy. Thanks Harjeet for this very well-written review. And I think, this must have become fashionable now to not to mention the publisher or the price as one can easily search it on Flipkart. For those who haven't, let me mention it that this Harper Collins novel, will cost you Rs. 149/- on Flipkart and Rs. 139/- on Homeshop18. Good you also revealed that it is autobiographical (well almost) novel! :-) However, the author would perhaps do well to get out of this 'autobiographical mindset' if she wants to write more and more! Yes, indeed, Mr Arora, it is true all information is so easy to get on the Net, but I should have mentioned both for the sake of reader service. Thank you for filling in.